The original home of the bouncy Balearic beat, Ibiza is famous for its image - loud, brash, outrageous and undeniably fun. Whilst the holiday hordes (and hormonally charged teenagers) head for the "fish 'n' chips" resort of San Antonio, gay and lesbian visitors prime destination is the Islands capital - Ibiza Town, a charming old town with plenty of atmosphere and character. The following pages should point you in the right direction, for gay and gay friendly accommodation, or that popular with gay travellers. 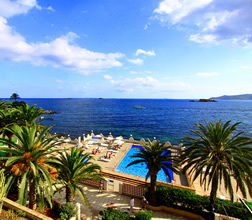 Ibiza Town offers everything from hostels with shared bathrooms, to 4-star hotels, ranging from €14 to €230 per night. Your priority may be quality, the ability to take people back, economy, peace and quiet, or style and location. One priority may negate another, in terms of what is on offer. 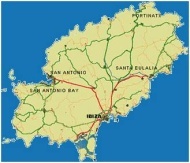 But note: Ibiza is a long established resort and much of the islands accommodation was built in the 70's. Whatever you want from a holiday, Ibiza is one destination which is more than likely to offer all that you could want - and plenty more besides. Even though Ibiza is not known as a 'villa destination', villas are available, and are scattered all over the island, and can be great fun if a group of you are travelling. 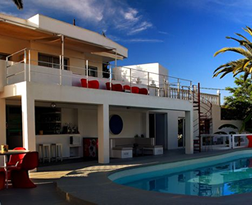 Almost all villas in Ibiza are privately owned, and in relatively short supply, the owners allegiance to any particular agent changes as often as the average drag queens wig. The resorts we offer in Ibiza: IBIZA TOWN - dominated by the historic, World Heritage site of 'D'alt Vila', Ibiza town has a good selection of trendy gay bars and restaurants and quite a bit of charm. 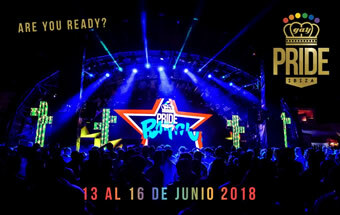 However, the town is a working, built-up area and can be noisy: most tourists looking for a gay holiday stay in the neighbouring suburb of FIGUERETAS, which is a 10 - 15 minute walk away. Developed through the 70's, Figueretas has a pleasant bay with a couple of small beaches, and a handful of gay bars but isn't much to look at! The main gay/nudist/cruising beach at Es Cavallet is several miles away but can be reached by a frequent (if usually packed!) local bus service that runs through Ibiza Town and Figueretas - it's worth making the effort to get to & a car make life a lot easier! The resort is summer only, and is busy from late May to late September - outside of this you may find that some bars/hotels/restaurants are closed. The La Finca is a beautifully converted farmhouse transformed into a gay oasis and two miles from Ibiza Town. Each room is uniquely designed with there own individual furniture and fixtures, but all with bathroom room and air conditioning. There is a magnificent pool surrounded by sunloungers, an indoor bar. A lavish breakfast is served each day until 1pm (included in the price), there is also a sauna. The Situated on top of Ibiza Town hills and within 10 mins from the lively town centre, you will find yourself enchanted by a consstant breaze and memorable views of the long bay of Playa d'en Bossa. The Cenit is in a quiet residentional area, and a long favourite with gays. 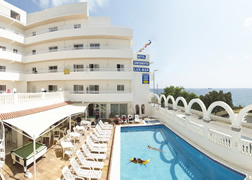 Marigna is Ibiza's largest exclusively gay men's hotel, and is right next door to Ibiza town. It has 44 double rooms with bathroom/shower, WC, sat-tv, direct call phone, a fan and safe. Internet access is available in the reception area. There is a roof terrace for sunbathing, complete with a jacuzzi and sauna. 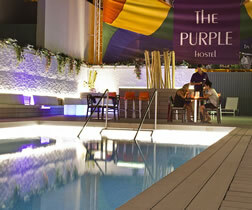 The PURPLE by Ibiza Feeling Gay Only Hotel is a dream come true in Ibiza! 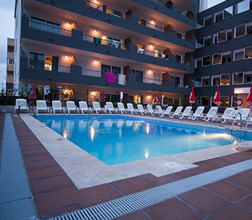 It is the first and only accommodation in San Antonio, Ibiza, dedicated exclusively to the LGBT market. The PURPLE is best described as a space for people who do not like spending their holidays in multistorey hotels with masses of tourists. Accommodation Only, Bed & Breakfast, Half Board. 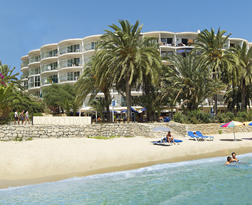 The Hotel Argos is ideally located by the beach at Talamanca, next to the exclusive Ibiza Marina. It is only a 10 minute walk or short ferry ride from some of Ibiza's most famous attractions, the historic Ibiza Old Town and the lively port area. This hotel is on a bed and breakfast basis during the winter and a half board basis during the summer. Located in the resort of Figueretas, this excellent 4 star property is only 10 metres from the beach and a short walk to Ibiza Town with its shops, and lively nightlife. Ideally recommended for those seeking up market accommodation in a prime location with excellent facilities and service. There is a la carte restaurant, cafeteria, dinning room and bar. 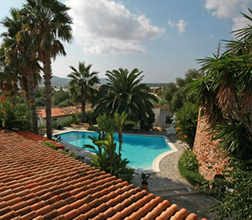 There is a sea front swimming pool, gym, sauna, and sits in well maintained gardens. Adults Only Hotel. 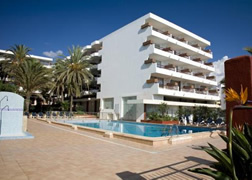 This first class modern hotel is located on the Figueretas waterfront and beach. 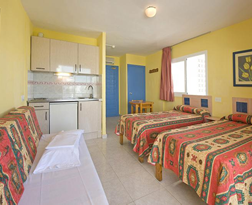 The rooms are comfortably furnished to a good high standard, bathroom, telephone, and some rooms overlooking the sea. There is a International restaurant, all rooms have air conditioning, satellite television, there is a large outdoor pool and a solarium. Maid serve 7 days. 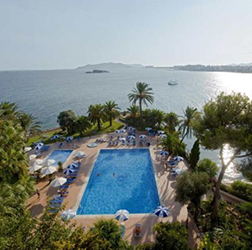 The Royal Plaza hotel is a luxurious four-star establishment situated in the centre of Ibiza Town and so benefits from exceptional access to all of the local attractions, including the beautiful beach, world-class nightlife and stunning scenery. Open All Year round! The Central Playa occupies a great situation in the centre of Figueretas, within a few minutes walk to the beach and only 10 minutes walk from Ibiza Town. A range of bars, restaurants and shops in the vicinity. 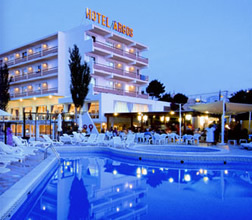 A Ibiza Hotel location suitable for young people. 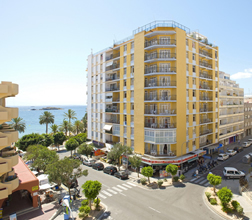 The El Puerto Hotel is located in the centre of Ibiza Town, on the doorstep of many shops, bars and restaurants. A three star property, has recently been refurbished to a good standard, with many of its rooms now featuring air conditioning. For those seeking comfortable accommodation in an excellent location, then we recommend you look no further. The Apartments Lido are located directly on the sea promenade in Es Vivé, Ibiza town (1 mile from the city centre) which leads up to the famous beach Playa d'en Bossa. The Apartments are the perfect starting point towards the old part of town and towards the trendy places to be night and day. These clean and comfortable apartments occupy a fantastic front line position with dreamy views out over the Med. The recently refurbished LUX MAR has a unique situation only 300 m from the Figueretas beach and 10 min walking to the port and the town centre with its lively nightlife atmosphere, restaurants and bars. 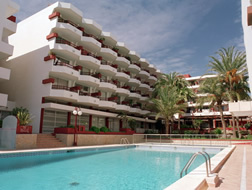 Hotel Maritimo is located in a priviliged area of Ibiza town, sea side on the Figueretas Paseo Maritimo (maritime boulevard). It has a small beach surrounded by palm trees, close to Figueretas beach. Just a five minute walk from the Ibiza town center and the lively port with its night life, full of bars and restaurants. On the front line, these two imposing buildings with 142 Apartments and 24 Studios, are situated in a quiet yet lively area on the seafront just 20 metres away from the beach. They are a perfect choice for those seeking the freedom of a self catering holiday combined with the use of all the facilities and amenities of a 3 star hotel. Playa Sol is situated 50m from the seaside and walking distance from the long beach of Playa d'en Bossa. The port and the town center with its lively atmosphere, restaurants and bars can be reached by walking, bus or taxi. The apartments are equipped with air conditioning, lounge, kitchenette, full bathroom and balcony. 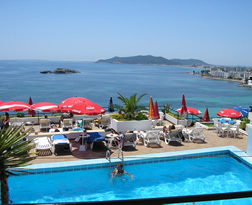 This gay friendly hotel is situated in Figueretas beach and close to Ibiza Town. This well equipped property offers excellent value for money, and is a popular choice by gays across Europe; it is only a few metres from the beach and within 100 metres of the gay bars, cafes, clubs, discos and shops. 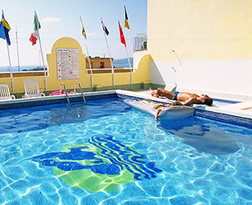 The hotel has a bar, swimming pool, solarium, terrace or balcony. All rooms are En-suite.